Research In Motion is preparing a series of new smartphone models in order to enliven the global mobile phone market. One of its product candidate Touch BlackBerry Touch 9860 (Monza). Only, unlike the leaked images that never appeared before, this time a photo display showing the different design concepts. From the latest picture shows that the BlackBerry Touch 9860 carrying the physical buttons, not anymore capasitive touchscreen button as shown some time ago passed its version of CDMA, the BlackBerry Touch 9850 aka Monaco. Seeing this seems a bit unusual for the manufacturer, given the producers seemed to offer two options for the selected design concept. But, later still it's up to RIM's option, to select the desired design for its products. Only, in the promo ad leaked about the BlackBerry Touch 9860 looks model capasitive button. So, will once again taste the rim. 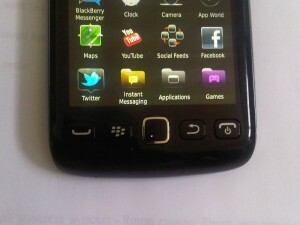 In the latest leaked photo also shows that the BlackBerry Touch 9860 is running BlackBerry OS 7. However, for other specifications have not yet confirmed. But, considering this smartphone entered the ranks of the latest generation of BlackBerry products is predicted to carry the 1.2 GHz CPU, 768MB RAM, 5 MP camera with 720p video recording as well as several others. Also, of course, 3.7-inch touch screen (WVGA), with a density of 253DPI.